When cold weather blows into Jackson County, this haven for outdoor recreation turns to the snow. You’ll find plenty of exciting activities to enjoy in the wintertime, including skiing that is perfect for beginners, snowy zip lining and plenty of cozy spots to stay for the weekend. Nestled in the Blue Ridge Mountains of North Carolina, is the only place in Jackson County that offers skiing and winter zip lining. Starting in mid-December, the resort’s snow machines churn out snow onto the slopes. Perfect for beginners, take the quad chairlift to the 1,600-foot main run, which features a vertical drop of 200 feet. Good for beginners, you can spend time perfecting turns and ski skills without the hassle of crowds that often come at ski resorts. 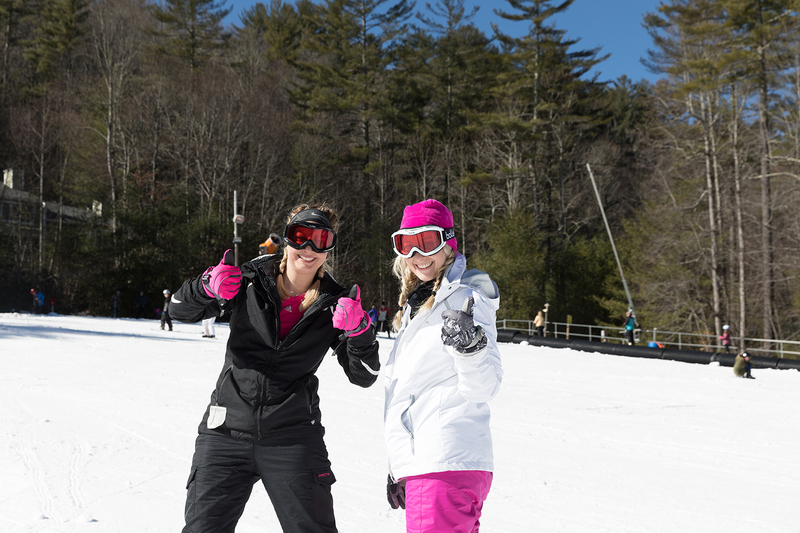 Newbies can start out on the bunny slopes, where certified instructors teach the basics of snowboarding or skiing. The “magic carpet” conveyor belt saves time lugging skis up the bunny slopes by transporting skiers to the top of the slopes. Skiing sessions last an hour and 45 minutes. If skiing is not your thing, try snow tubing at Frozen Falls Tube Park or ziplining on the Vordach Zipline. Snow tubing is like sledding, only with giant inflatable tubes that glide fast down the hill. Tube down the 700-foot, multi-lane tubing run, with steep walls on both sides to allow for more control. 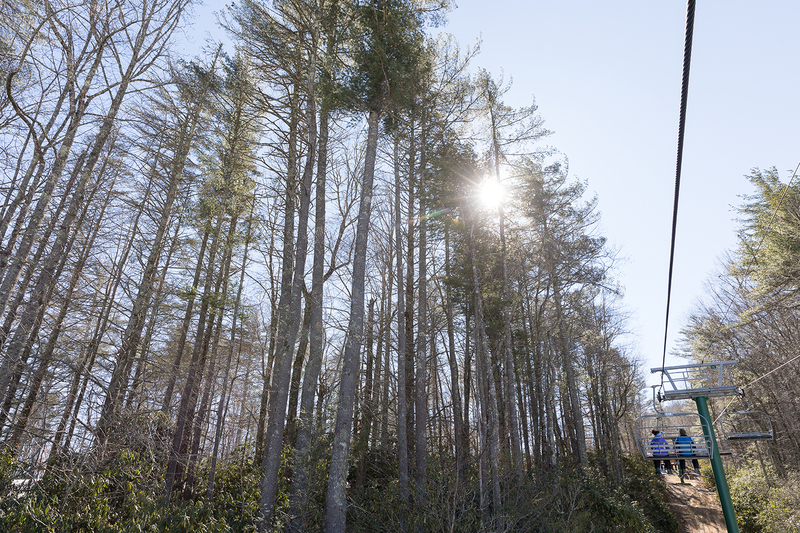 Whether it actually snows in Jackson County or not, the winter zipline experience zips riders over the snowy ski slopes and through the bare winter trees at Sapphire Valley while watching the skiers below. Find the rates for all activities at Sapphire Valley Resort online at here. The resort’s rental and ski shop allow you to rent or purchase any winter ski and snowboard gear for a day on the slopes. The fun continues beyond the holidays at Sapphire Valley, where the annual Outhouse Races takes place every February. Imagine watching someone dressed in a crazy outfit climb into a decorated outhouse built on skis, sit on a toilet seat and fly down the slopes—all while attempting to stay upright without crashing into the banks. Outhouses are encouraged to be creatively decorated, and the more outlandish the participant’s costume, the better. Past participants included themes like “Who Cut the Cheese,” “Redneck Wishing Well,” and a clown dressed up in an outhouse named “Party Poopers.” Free to watch, the Outhouse Races are a spirited event full of creativity and humor. The Outhouse Races will be on February 17, 2017. The afternoon starts out with a parade to view all the outhouses, followed by racing at 3 p.m. Details will be available at www.skisapphirevalley.com/great-outhouse-races.html. All proceeds of the event benefit local charities. You can watch a video from one of the past Outhouse Races: www.youtube.com/watch?v=YRnWx2Rb1Ww. Take time in between ski runs, tube rides or zip lines to lounge and dine around Cashiers. On-site at Sapphire Valley Resort, the Four Seasons Restaurant offers light fare for lunch or dinner. For a casual atmosphere and a good beer, head to Micah’s Pub, at the entrance to Sapphire Valley. Make a weekend out of skiing and stay in a vacation rental close to Sapphire Valley. Whether looking for cozy cottages for two or a family cabin for six, the High South Rental agency offers villas and comfy suites for all, with scenic views of Sapphire Valley, Cashiers and Lake Glenville. Check out available rental at http://www.sapphirevalley.com/vacation-rentals.html. The tentative open date is 12/16. Please call (828) 743-7663 to check conditions; view the resort cam of the ski slopes here.